The bladder is generally located in the pelvis which stores and collects urine and bears a muscular wall that allows contraction and expansion. Invasive bladder cancer is generally more likely to spread to different parts of the body. 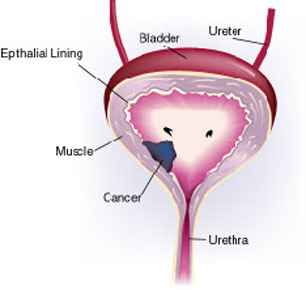 Cancer inside the bladder lining is called non-invasive bladder cancer or superficial bladder cancer. It has an excellent survival rate and more than 75% of bladder cancer is indicated and diagnosed as a superficial bladder cancer. It has been estimated that 90% of bladder cancers are recognized as transitional cell carcinoma while adenocarcinoma, squamous cell carcinoma and small cell carcinoma account for the rest ones. The symptoms below may not be a sign of cancer but these should be checked by a doctor. Feeling the need of urination even if someone is unable to. A CT scan of the pelvis and abdomen to get detailed images of pelvis, bladder and the kidneys. An intravenous pyelogram (IVP) is a test in which a contrast solution is put into your vein and the X-rays of kidneys, bladder and ureters are taken for detailed investigation. A cystoscopy is a test in which a thin telescope-like instrument with a light is inserted slowly into the urethra and then passed into the bladder for a complete examination of internal lining of bladder. This test can help a doctor to remove a small sample of that tissue for examination. Your doctor can take help via these tests to confirm if the cancer has spread to other parts of a body or not. Among all, surgery is a primary treatment suggested for bladder cancer. Hey, I just found your blog – thank you for the good work. I wanted to inform you that it’s not displaying properly on the BlackBerry Browser (I have a Tour). Anyway, I’m now subscribed to the RSS feed on my home PC, so thank you!